Is your horse stiff, tense or resistant? Would you like to be more balanced and confident in and out of the saddle? 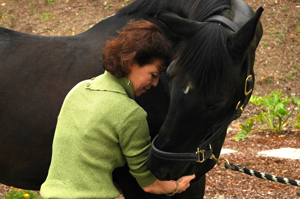 I can show you how to create the joyful horse-human partnership you desire. Do you want a sound, happy horse? Do you want to be a confident, skillful horsewoman? Through unique hands-on exercises and fun, positive training, Mary Debono helps horses and humans of any age be balanced and confident in mind and body. Just like humans, horses develop inefficient habits of moving, with some of the joints and muscles doing more than their share of the work. Soreness, fatigue and degenerative changes such as arthritis can be the result. Debono Moves can be a way out of this vicious cycle. Debono Moves uses gentle, precise touch and movements to remind the horse how all his parts can work together harmoniously, improving body awareness, athletic performance and confidence. How does Debono Moves differ from equine massage and other bodywork techniques? With equine massage and many other bodywork modalities, the therapist generally focuses on releasing tension in the horse’s muscles. This can be a pleasurable, helpful approach. However, as a former equine massage therapist, I found that most horses would return to their chronic muscular tension and poor movement habits. And if you think about how the brain organizes the body, this makes sense. If you focus on changing muscles, you’re dealing with lower-level organization. After all, muscles don’t give orders, they only take them. It’s the horse’s nervous system that tells the muscles when to contract and relax. Let’s imagine that a horse is having difficulty rounding his back. The veterinarian rules out a serious medical condition, but notes that the horse’s back is sore and tight. It’s tempting to simply focus on relaxing the horse’s back muscles. And doing so would probably help the horse feel better and be able to round his back more easily too. For a little while. But rounding the back actually requires an exquisite coordination of various parts of your horse’s body. It’s not just about the back muscles. For example, did you know that your horse’s ribcage plays an important role in rounding his back? Unfortunately, many horses have restricted movement in their ribcage, which can create chronic tension in the extensor muscles of the back. This makes rounding the back difficult and leads to a tight, sore back. So we need to remind the horse that moving his sternum and ribs in specific ways can release the tension in his back and make his life a whole lot easier. We’re communicating with the horse’s nervous system when we do this. And we’re getting to the root cause of the horse’s problem. Debono Moves uses gentle, precise touch and movements to help the horse feel how all his parts can work together harmoniously, improving body awareness, athletic performance and confidence. In a career spanning more than 25 years, I have helped horses with a multitude of problems. To list a few, I have helped: stiff horses become more flexible; tense, resistant horses relax and enjoy their work; “girthy” horses find pleasure in being saddled (yes! ); and dressage horses have more swing and impulsion. In short, I help horses maximize their movement potential. Debono Moves sessions have benefited horses of all ages and levels of fitness, from improving the performance of an Olympic-level equine athlete to helping an arthritic gelding move more freely. Questions? Please email Mary@DebonoMoves.com. Let me know what concerns you have about your horse. I’m here to help. Click here to read Mary’s article on how the Feldenkrais Method can help riders. It was published in Equine Wellness Magazine, Vol 9, Issue 2. The Feldenkrais Method teaches riders how to stop interfering with themselves, taking the struggle out of riding. Years of sitting behind a desk, driving a car, dealing with stress and nursing old injuries often leads to the development of unhealthy and restrictive movement patterns which overuse parts of the body and lead to pain and stiffness. These habitual patterns become so ingrained that they are lost from our awareness. The restrictions feel familiar and thus seem “normal.” We no longer realize that we have the potential to be flexible, coordinated and graceful. The freedom of movement we had as children seems a distant memory. Feldenkrais® can help you recover it. Horses appreciate the hands-on Debono Moves work. What is so extraordinary about the Feldenkrais Method is that it does not attempt to correct or manipulate. Rather, it is an educational approach that is relaxing, pleasurable, and supportive. Using noninvasive touch and movement, a Feldenkrais practitioner clarifies for the client what he is really doing and helps him explore more effective movement options. This sensory learning approach is in contrast to attempting to make postural changes through force of will. The familiar refrains of “Sit up straight, pull your shoulders back, sit evenly,” etc. often fall short of their goal as they can create even more tension in the rider. Feldenkrais helps give riders an increased awareness of their movement, allowing them to be more aware of their horses’ movement. This can significantly improve a rider’s timing and coordination of the aids. As riders gain independent use of each hip, seat bone, leg, shoulder, hand, etc., they can match their action with their intention. Balance improves, confidence soars and riding becomes a true pleasure. Many people believe that a supposed weakness or bad habit must be “overcome” through some rigorous, forceful routine. One of the most rewarding benefits of Feldenkrais is the realization that improvements in ease of movement can be learned in a pleasurable instant. Flexibility, coordination, and power then increase automatically. Feldenkrais-inspired riders understand that the same principles apply to their horses. They realize that a horse’s difficulty in responding to their aids is not usually a result of disobedience, but often stems from confusion or pain. And these riders first look to themselves as a possible cause. This understanding leads to more harmonious partnerships with horses as well as a desire to help horses learn how to move with ease and elegance, rather than riding with force and gadgets. As is true with people, improvements in equine movement prevent wear and tear on joints and increase strength and stamina. Over the years I have helped many riders whose problems included: rounded shoulders, swinging legs, tight shoulders and hands, errant heels, stiffness, poor balance, aching backs and necks, sore knees, collapsed hips or carpal tunnel syndrome. While Feldenkrais does not take the place of riding instruction, it can be a remarkably effective tool for maximizing the potential of both horses and riders. Please visit our Humans page for more information on how the Feldenkrais Method can help you!